My husband’s great grandfather John Morley (1823-1888), John’s wife Eliza née Sinden (1823-1908) and their two children, Elizabeth aged 3 and William aged 1 emigrated to Australia in 1853, arriving in Melbourne on the ‘Ida‘ on 12 July. Five years before, on 17 September 1848, John Morley, then 25, had married Eliza, also 25 years old, at Hurstpierpoint in Sussex. John Morley was a railway labourer. In 1851, he and Eliza and their one year old daughter Elizabeth were living at 97 Railway Terrace, Keymer, a couple of miles from Hurstpierpoint. Keymer Junction, which had opened four years before, was an important railway junction on the East Coastway Line to Lewes and the Brighton main line. In 1854, a year after the Morley’s arrival in Victoria, they were living in Collingwood, a suburb of Melbourne. On 10 March, little Elizabeth Morley died, a few months before her fifth birthday, of tabes messenterica, tuberculosis of the abdominal lymph glands. This disease, rare now with pasteurisation, is an illness of children, caused by infected cows milk. In the first annual report covering deaths to 1854, the Registrar General of Births, Deaths and Marriages of the Colony of Victoria listed tabes mesenterica as one of the diseases of the digestive organs. 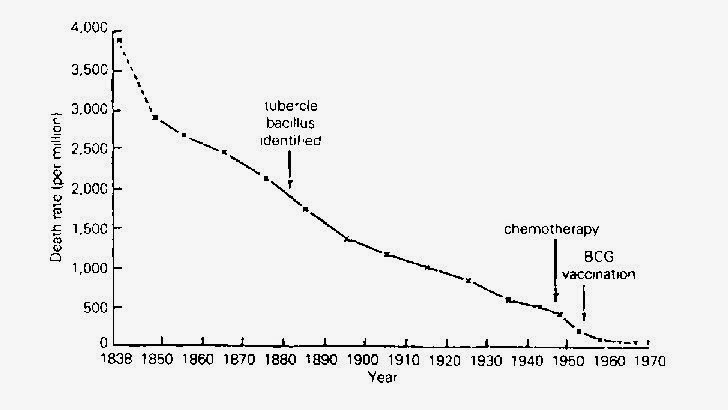 Deaths from diseases of the digestive organs, including tabes mesenterica, teething and enteritis, chiefly deaths of children, constituted about seven percent of total deaths for that year. The Report paints a picture of Melbourne and the goldfields struggling with the challenges of the rapid increases in population. Victoria’s population trebled from 1851 to 1854. 78,000 arrived in the year 1853-54, the Morley family among them. John and Eliza Morley had eight children, only three survived childhood to become adults. Vamplew, Wray, 1943- Australians, historical statistics. Fairfax, Syme & Weldon Associates, Broadway, N.S.W., Australia, 1987. page 26. 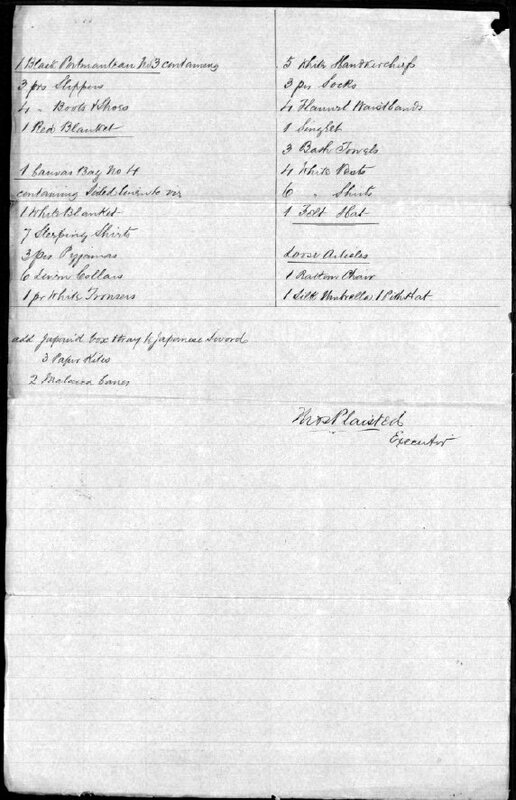 Public Record Office Victoria , VPRS 14, Assisted passenger lists (index) retrieved from https://www.prov.vic.gov.au/explore-collection/explore-topic/passenger-records-and-immigration/assisted-passenger-lists. Walter Wilkes Plaisted (1836 – 1871), my 3rd great grand uncle, died of phthisis (tuberculosis) on board the SS Geelong during the passage from Singapore to Melbourne. 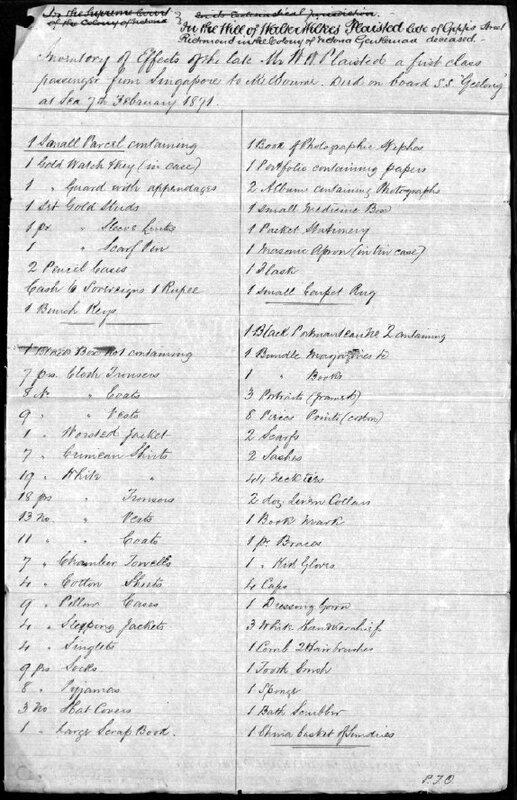 His probate file, held by the Public Records Office of Victoria, includes an inventory of his effects, a fascinating insight into the possessions of a traveller of 1871. Walter was the son of John Plaisted (1800 – 1858) and Ann nee Green (1801 – 1882). He was the fifth of eight children. Walter’s father, John, also died of tuberculosis and in fact the family quite possibly emigrated to Australia for the sake of John Plaisted’s health. 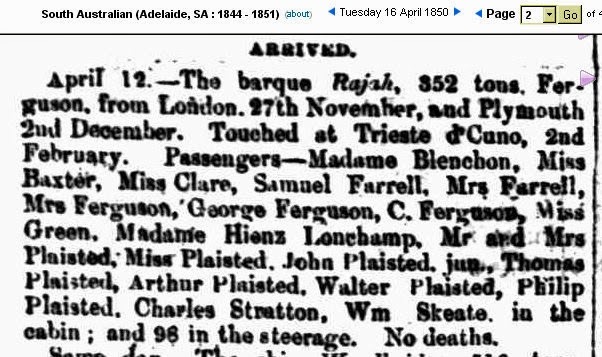 The Plaisted family arrived in Adelaide on the Rajah in April 1850. Walter was then fourteen years old. In 1856, aged 19, he was witness in a court case about a forged check. He was a clerk of the South Australian Banking Company. According to his father’s death certificate, John Plaisted had moved to Melbourne five years before his death, about 1853. Walter had obviously stayed in Adelaide, at least until 1856, after his parents moved to Victoria. At the time of his death Walter was unmarried. He had made a will and left his possessions to be divided between his five living siblings. At probate he was declared to be a gentleman usually residing at Gipps Street, Richmond. Walter’s property amounted to less than forty pounds. His brother Thomas was sworn to administer the estate. Inventory of effects of the late W W Plaisted a first class passenger from Singapore to Melbourne. Died on board S. S. ‘Geelong’ at sea 7th February 1871. 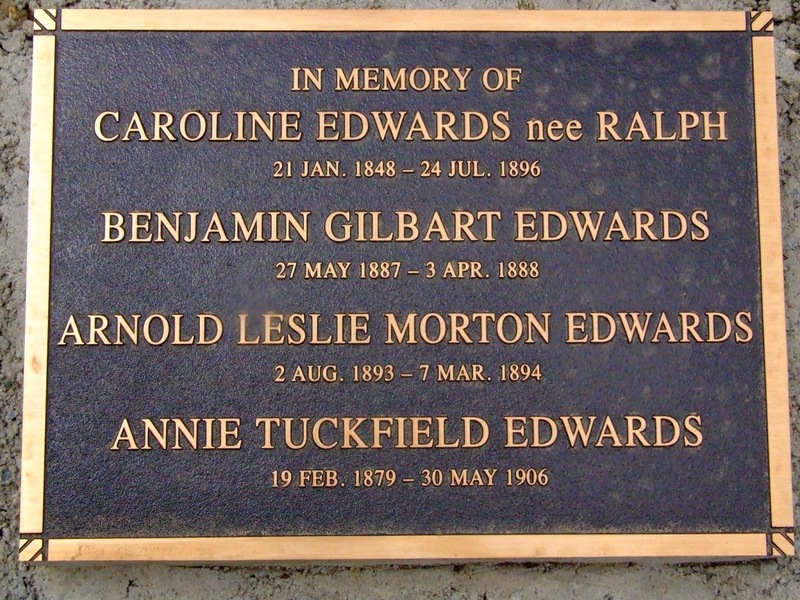 Annie Tuckfield Edwards (1879-1906) was born Port Adelaide, South Australia, to Francis Gilbart Edwards (1848-1913) and his wife Caroline Edwards née Ralph (1850-1896). Annie was the fourth of their ten children. Annie’s parents had married in Ballarat in 1870. Their oldest three children were born there. Sometime between 1876 and 1879 the family moved to South Australia. Two more children were born in South Australia. A seventh child was born in Ballarat in 1887 and not long afterwards the family moved to Melbourne, and this infant son died in Richmond, Victoria in March 1888. Annie’s father Francis had joined the railways on 1 December 1887. Two more sons were born. From the place of birth information on their birth certificates it appears that the family moved from Richmond to East Brunswick, Victoria. In 1893 the youngest child, Arnold, was born in Brighton and died a year later in Elsternwick. In July 1896 Caroline died, in Grant Street, Brighton of cancer of the uterus. Annie was 17 when her mother died. 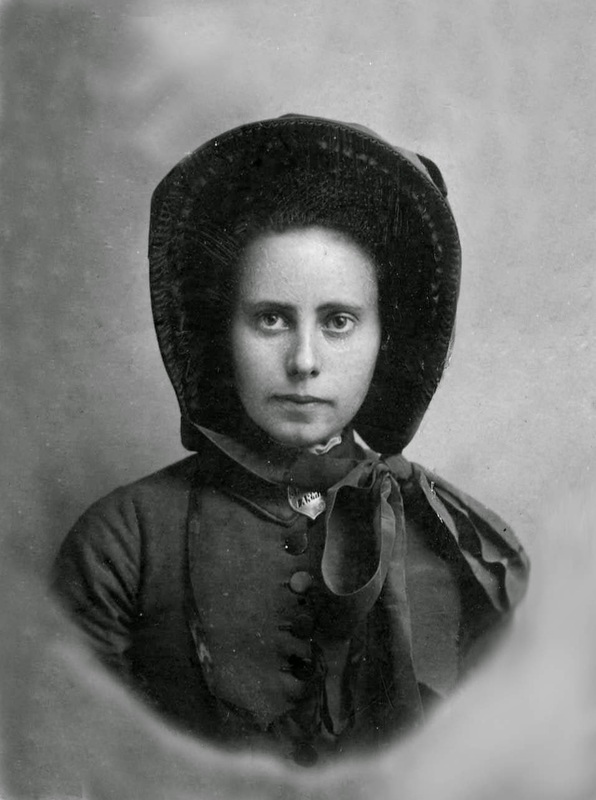 Annie began following the church of the Salvation Army around 1897. Two years later she became a member of the church, a “Salvationist”. The Salvation Army was founded by William Booth, a former Methodist Reform Church minister. The Edwards were Methodists and were very proud of their connection by marriage to Francis Tuckfield, a Methodist missionary of the Geelong district. Francis Tuckfield (1808-1865) was the husband of the sister of Annie’s grandmother. Annie’s middle name was bestowed because of the Tuckfield connection. The Salvation Army began as a mission to the poor in the East End of London in 1865. The Church commenced in Australia in Adelaide in 1880. By 1900, the Salvation Army in Australia had about 50,000 soldiers (members) in 512 Corps (churches) with 1,929 officers, cadets or employees. When she joined the Salvation Army, Annie became a “Young People’s Worker”. 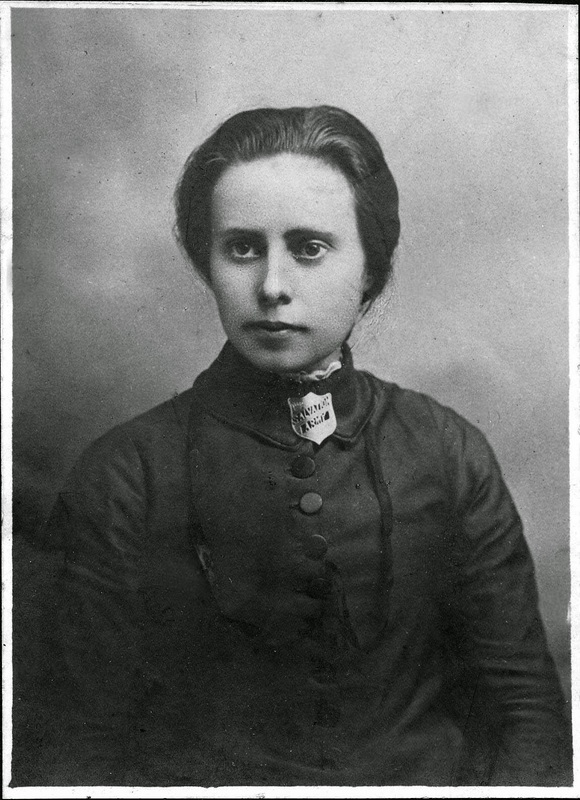 Around 1904, five years after joining the Army, Annie applied to become an Officer. Her application was rejected because of her poor health. However, she was made a Sergeant responsible for “Rescue Work” and she was later appointed to the Girls’ Home in Beaumont, South Australia. Her health improved and she was promoted to Lieutenant around 1905. The Girls’ Probationary School was run by the Salvation Army under the control of the State government. The home opened at Woodville in 1901. It was at Sea View House, Beaumont from 1905 to 1910. It was then at Norwood and from 1912 at Fullerton. The school was for children in Government care considered to have behavioural problems. In 1906 Annie became ill with consumption – tuberculosis – and died in May aged 27 after an illness of five months. She was buried in the Wesleyan section of Booroondara General Cemetery at Kew, a suburb of Melbourne, sharing a plot with her mother and two infant brothers. The Salvation Army’s newspaper, the War Cry, had an obituary on 15 June 1906. Annnie Tuckfield Edwards was my husband’s great grand aunt. I am grateful to the research officer of the Salvation Army Heritage Centre in Bourke Street Melbourne for locating and making available articles about the Edwards family in its archives. I am also grateful to my husband’s cousin for the providing photographs, which prompted me to research Annie’s short life. 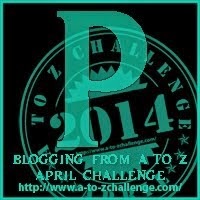 My fourth great grandfather (4*great) John Plaisted (1800-1858) died of phthisis, more commonly known as tuberculosis. In early colonial days the disease was a part of daily life and few families were lucky enough to avoid it. There was no cure. The usual medical advice was a move to a warm, dry climate, a nutritious, nourishing diet, and complete rest. The Plaisted family moved to Melbourne. 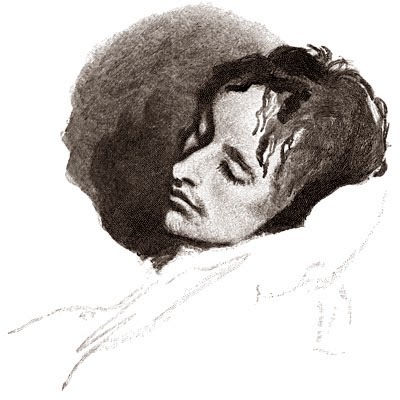 They were living at 100 Collins Street when John finally succumbed to his illness. Tuberculosis is an infectious disease caused by a bacterium. The most common type is an infection of the lungs. A common symptom is a persistent cough and later coughing up blood. The patient loses his appetite and then weight. Other symptoms include a high temperature, night sweats and extreme tiredness. Tuberculosis was a slow killer; patients could waste away for years.